Dr. Sam Bierstock is an eye surgeon and a nationally respected expert on electronic health record systems, and past Chief Medical Officer of IBM – but he best known for having come to national attention as a parody and satire entertainer in the 1990’s with his professional band, Dr. Sam & The Managed Care Blues Band (www.managedmusic.com). Dr. Sam and his band performed all over the country with such tunes as “You Picked A Fine Time To Leave Me Blue Shield”, and “You’re One Hip Mama – ‘Cause They Won’t Pay For Two”. In 2004 Dr. Sam wrote and posted a song in tribute and thanks to our WWII veterans called “Before You Go” (www.beforeyougo.us) which has since been downloaded free from its website more than 25 million times. His songs have received personal thanks from Presidents George H.W Bush, George W. Bush, and Bill Clinton, presidential candidates, governors and members of Congress. He has been featured in People Magazine, USA Today, the Wall Street Journal, on NPR and all of the major cable TV and broadcast media venues for his comical messages about serious matters – with more than 75,000 CDs sold. In 2007 Dr. Bierstock was awarded the prestigious George Washington Honor Medal, Freedoms Foundation for responsible citizenship for his work in honoring our aging veterans of WWII, the Korean War, and the Vietnam War. He currently serves as Vice President of Vets Helping Heroes (www.vetshelpingheroes.org), a 501c3 charitable organization that raises funds to provide support and service dogs to our wounded veterans. Having musically tackled the serious issue of our debt of gratitude to our aging veterans, and comically addressed Managed Care and the need for healthcare reform, Dr. Sam has turned his attention to the issue of Political Correctness. 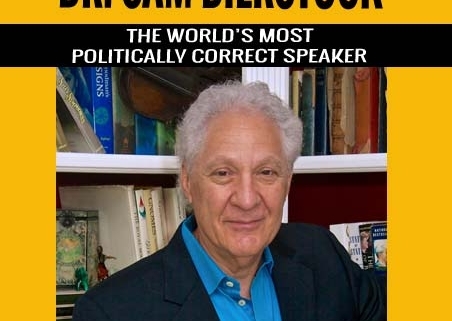 Billed as “The World’s Most Politically Correct Speaker,” Dr. Sam guarantees that his speeches are designed so that absolutely no one can be offended. His most recently published book, “Politically Correct Fairy (in the Mythical Little Magic Person Sense) Tales and Conservative Rebuttal Tales” has been reviewed as a hysterically funny depiction of classic fairy tales, told first from an overly politically correct vantage point, and then from an ultimate no-nonsense rebuttal vantage point. The book is available in electronic and paper formats on Amazon.com.